So here we are in May, and I’m now avoiding Facebook because the sight of so many friends in full-swing competition season is utterly depressing. I’m so happy for their successes, but it’s killing me to be so out of the loop. Area V has, oh, about 7 horse trials a year, maybe. Probably 5 of those are within a reasonable driving distance. We missed the two this month because Ryan’s in the field. (His new job? In laymen’s terms, he’s an observer-controller for troops training for deployment–to sum it up, he’s gone. A LOT. Like, I’m effectively a single mom for weeks at a time.) That means we have to wait until September for the next recognized horse trial. Which, tbh, is a good thing, as we’ve not schooled XC since we left Aiken. If you’re not familiar, Chip was a sales horse that I fell in love with and decided to keep as my own. (Made possible by a very gracious Lara Anderson, who deserves a blog post of her own) We’d capped off the season with a successful run at training level at Pine Top before I finished out my pregnancy, and then started back at BN to rebuild his fitness and confidence once I’d had Reagan. But now we’re in no man’s land, and I’m reverting back to amateur status because I’m working a *normal* full-time job. I’m trying to figure out how to ride when Ryan’s gone. I lose so much progress when he’s in the box because I can’t exactly leave Carson to baby-sit the baby. If any working moms have any suggestions, I’d be glad to hear them. I did make acquaintance with another eventer in the area through my Area III connections, oddly enough. Funny story how we met, but that’s another blog. Chip and I have a date to meet up at her place to XC school next month–it’s only a 3 hour drive, LOL. (If you missed the previous post, EVERYTHING is a 3 hour drive down here.) We’ll use that to gauge our progression & the next weekend is a schooling trial, where we’ll run at BN just to get Chip’s feet wet, literally and figuratively, as it’s been several months now since we’ve run a trial. It took us three trips to get the entire family to Fort Polk from Statesboro, Georgia. The kids and I moved first, tackling a 14 hour drive in two days. Ryan followed about a month later–he had to finish out at Ft. Stewart. To get the house, we had to move in by 15 November. Then, a few days before Christmas, I took off in Bertha Blue Due hauling the gooseneck to pick up the critters. It was an adjustment for Chip, Wynni and Gretchen. Chip left behind his buddies, Owin & Blackjack; Wynni left behind her girlfriends, and Gretchen…well, Gretchen is one special chicken. She shunned the guineas and promptly moved into our attic. Winters in Lousiana aren’t too bad, but between the rain, short days, hours at the office, and a baby, I didn’t ride much to say the least. I brought along some hay, but it quickly dwindled, and finding a good source of quality horse hay down here proved impossible. I became incredibly grateful for Standlee compressed bales, beet pulp shreds, and alfalfa pellets. Farriers were another issue altogether. We’re still working on finding a good one, and it’s a sore subject right now. Being a science nerd with a B.S. in Animal Science, I had already researched feed dealers in the area and was lamenting at the lack of what I deem quality feeds. I’m going to eat my words, though, because I am completely impressed with Purina nutrition. Our local Slagle Mall (they have very broad definitions of malls down here), the combination gas station, feed dealership, hardware store, post office, Uhaul rental, restaurant, and grocery store, carries Purina feeds. Without getting too technical, I’ve always snubbed Purina in favor of Seminole and Triple Crown feeds because I felt the ingredients were sub-standard. However, Chip’s coat and hoof quality are amazing, and he’s building lean muscle quickly and efficiently. He looks amazing, and the grass hasn’t even fully come in yet. I think that about catches us up through the winter. Blog 3 will discuss our training goals and plans and my desperate attempt to regain fitness. The best and the worst thing about the Army life is change. Every three years or so, we uproot our family, ship our household hundreds of miles, and adjust to whatever life throws at us. The good side of it is you become adept at making friends, incredibly resourceful, and amazingly resilient. The worst side of it is you’ll make awesome friends, a great life and have to leave it all behind. We recently uprooted from Fort Stewart, Georgia to Fort Polk, Louisiana. I’d always said I never wanted to go to Ft Polk. It’s number one on the top 10 worst military installations. I fought for Ft Bragg for two reasons: Denny Emerson (the George Morris of Eventing) and Koby Robson (my favorite dressage trainer). Alas, on 14 November, the kids and I were loaded down and headed to meet our household goods shipment at our new home in Leesville, Louisiana. The good news? We lucked into probably the best rental property we’ve ever occupied. I mean, it doesn’t get much better than this: fruit trees, a barn with a hay loft and electricity, fenced pastures, a stocked pond, expansive trails and more. But the worst news is I went from eventing paradise to the eventing desert. I joke that I’m probably the only eventer within a 100 mile radius, but the reality is that I’m actually probably the only eventer in a three hour radius. Literally everything is a 3 hour radius. And to top it off, because there’s no possibility of opening a lesson program down here, I’m now working a 40 hour/week office job. *gasp* I know. So, I’m looking at the bright side of things because I’m an eternal optimist. And, as time permits, I’m going to blog about this period in my life because it’s cathartic. 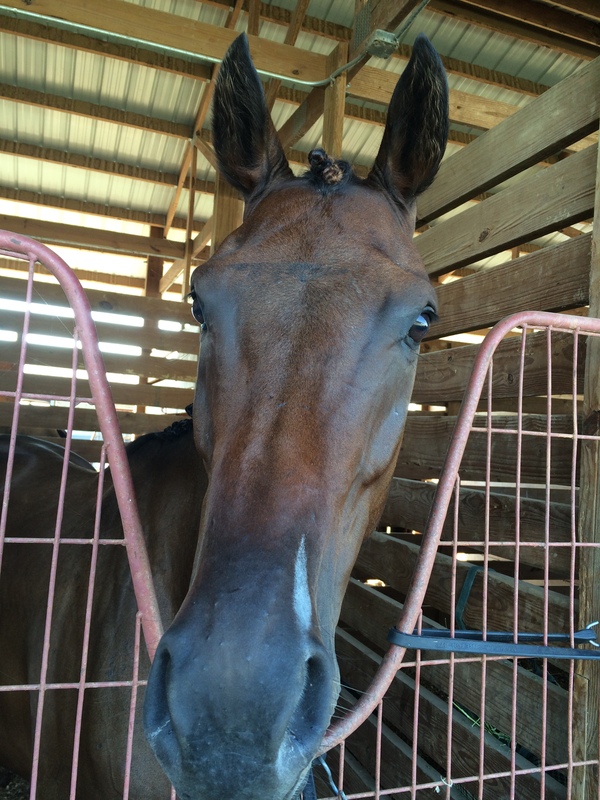 Welcome to the Cajun Eventer series, blog 1. I know you’ve all been eagerly awaiting more helmet cam footage. I can picture you now, pacing by the computer, “when is she going to post that footage? ?” Wait no further!! It’s here! Between my last post and this one, Chip and I ran training level at Full Gallop and then at Pine Top for our culmination. Full Gallop was wildly successful for his first recognized attempt at Training, with only time penalties for XC added to his dressage score. And, if Chip had run the way he wanted, we’d have had none of those. But, my primary goal with that run was to stay safe and finish–a purely educational run. I wish I’d worn my helmet cam for that one, because as you young’uns say, “we were on point.” He answered every question with easy precision, with only one bobble at the drop into water, and even then, he just needed a moment to take a look before he leapt. I knew Pine Top would be much tougher. I prepared. We did trot sets, galloped, dressaged, and gymnasticized in the weeks leading up to both Full Gallop and Pine Top. I had a long, frank discussion with my OB about the risks of running horse trials while five months pregnant. I did a lot of research. Ultimately, my doctor and I made the decision that the risks were acceptable given the safety precautions, and the fact that I would withdraw if my body told me I couldn’t handle it. Dressage morning, I braided in the dark at the trailer by lantern light. I love the time change, but it wasn’t working in my favor that weekend! Chip was uncharacteristically a little anxious. I chalked it up to the fact that he’d spent the night listening to momma and calf bawling for each other at the cattle farm where we stayed that weekend. I doubt he got much sleep. However, he put in a solid test, and I managed to steer us around, despite almost forgetting where I was supposed to go when I turned at B.
Stadium was daunting with maxed out verticals and oxers and bending lines and triples, Oh My! But, the course rode really well, and our homework paid off. We had one rail at fence 2; the course designer was pretty smart with his placement of that vertical. Chip was busy looking at the warm-up area beyond it, and he only snatched up his legs in time to jump. The baby had a greenie moment–can’t begrudge him for that! By now, I’m sure you’re thinking, “oh just get on with it!” Or maybe you scrolled past the text just to get to the video footage–I don’t blame you. I walked cross-country three times before Sunday morning. (In fact, I walked a total of 20+ miles that weekend, according to my Fitbit.) Knowing my horse, I figured we might have a couple of look-sees, and I was a tad worried about the trahkehner and coffin questions at 6 and 8. And perhaps the hay trailer at 12. Ok, yeah, I planned on gluing the seat of my breeches to my saddle and keeping my shoulders squarely behind my hips for nearly the whole ride. Not gonna lie. Like the superstar he is, though, he came out of the box ready for action. That monster trahkehner at 6 was barely a glance. In fact, I had to pull like heck to keep him from jumping the prelim trahkehner on our way to 7! He locked on, and I literally had to sit up and grab his face. The coffin combination at 8? Easy peasy. But, fence 9. That maxed out double brush monstrosity that I figured we’d just up and gallop over? Chip galloped up and said, “whoa, mom, that’s kinda big. Are you sure?” By this point, I truly had jello for legs. Ol’ lefty, missing the PCL and sporting a barely attached MCL, just up and quit on me. He thought about running out, and all I could think to do was shout, “Nooo, Chip!” We’d worked so hard, and Pine Top was our culmination–I wanted redemption. That horse. That giant heart of his. I admit, I’m prone to anthropomorphising sometimes, but I swear he heard the desperation in my voice, and he just leapt. I should’ve let him run out. I certainly didn’t whip or kick, but he jumped that fence for me. And it was awkward. I wish someone had gotten a video. I lost both my stirrups and grabbed his neck for dear life and somehow stayed put and galloped on to fence 10. Fence 11 was a rolltop into the water, bending line to a corner. Shoot, we’d schooled drops with bending lines to corners, so why would I worry about that one? Once again, I needed a little leg. By this point, Chip was developing a little doubt about my ability to get us around, and he slowly came to a stop in front of that corner. “Mom, if you wanted me to jump that, you probably should have had a little more impulsion to my canter. Just sayin’.” We cantered back around and hopped over it with no issues. But when he landed? I felt the switch in his brain. He grabbed the bit and might as well have told me to “sit down, shut up, and hang on.” He locked on to 12, took a quick glance, read the fence, and ate it for breakfast. 13AB was a log pile with a nearly 90 degree right hand turn to B, a skinny log. I sat up and prayed he’d come back to me, and my green little horse had an adult moment. It rode so beautifully. Angled cabins at 16? A breeze. We finished with 1 refusal at 11B and a few resulting time penalties. I was so thrilled with him. There are no words to describe the feeling of sitting on such a brave horse who will willingly jump obstacles that should scare the life out of him. And so, without further ado, enjoy the photos and videos from our Pine Top experience. They never look very big in pictures. Angled cabins were no problem. Chip made his training level debut this weekend at Jumping Branch Farm. Our last horse trial was Pine Top back in November, so a schooling trial was in order to gauge our readiness for the upcoming recognized trials in March. I also had two students competing in the beginner novice and novice divisions, so it was a very full day. Our first course walk was Friday night in the dark, but we were able to walk the course a second time Saturday morning after my dressage test. I made my fatal flaw here, not catching the exact off-shoot where I needed to head to fences 6 and 7. But, I found the fences & figured I’d know where I needed to branch off. Rookie mistake. When I galloped up the road headed toward 6, I went the correct route, second-guessed myself (because I’d missed that fork twice on my course walks), and re-routed to a road just before. A good 15-20 seconds in, I realized I’d screwed up big time. I turned Chip around & got back on course. I might’ve kicked myself for that, except, really I was kicking myself already for being a useless sack of potatoes in the saddle. Thank goodness for the wind tunnel effect, because it overshadows my heavy panting. I was absolutely no use to Chip, and yet, you’ll see, he carried us onward, ears pricked the whole ride. This weekend was a great learning experience. 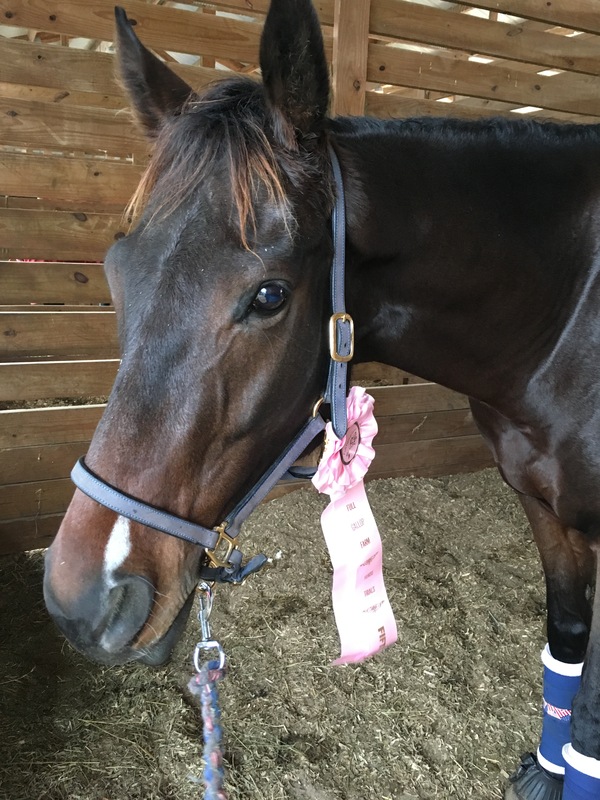 I plan on sharing my Eventing while pregnant experience in a series of blog posts, but for now, suffice it to say, it’s a lot different when your body isn’t performing the way you’re used to. In the meantime, enjoy a pair of fuzzy brown ears eagerly looking for the next fence! **This is a long post, but it has a happy ending and lots of pictures. The highs and lows of our sport are pretty extreme. The exhilaration felt as you pass through the finish flags on a double clear XC round is a high that cannot be matched. And knowing your green 5 year old OTTB just finished a tough Novice division in 3rd place at Pine Top takes you to the top of the world. But, then you’re walking back to the trailer, bursting with joy, and the TD drives by and says, “Guess what? You were eliminated–you didn’t pass through the start flags!” Suddenly, you’re in the lowest of lows. The bottom just drops out of your world. What a disappointment. Chip jumped his heart out and put in such a relaxed and obedient dressage test, and it was me who failed us. I went back and looked at the start box–I just couldn’t believe I’d missed going through the start flags, but sure enough, there they were. Two tiny flags stapled to one side of a set of wing standards, somewhat obscured below eye level, and certainly not very visible if you were making laps through the start box the wrong direction (which I was). It’s hard to describe, but the start box was fully open both sides (not like most start boxes that have a clear exit and obvious entrance), and they’d set up wing standards to close off the open corner. By putting the flags on one set of standards, they determined the rider must pass through that side to begin. I went out the opposite direction. Because the box was on an angle to the first fence, I got no advantage–it was essentially the same route as going out to the ‘left.’ It was my error, though, and it cost us third place. However, Chip had no idea we didn’t finish in 3rd. He just knew I was happy with him, and he was happy to eat hay at the trailer while we sadly packed our things to head home. He CAN lengthen his trot! His first ever brush fence…at the second fence on the course. That left front was still somewhat bothering him, though, and it was obvious in our dressage test, where we were still slightly counterbent on the left lead. Because he has such large osselets on his LF, I asked Lara if we could get a current screening set of his fetlock. We set the appointment for the following Friday, and true to form, Chip pulled his right front shoe on Tuesday. 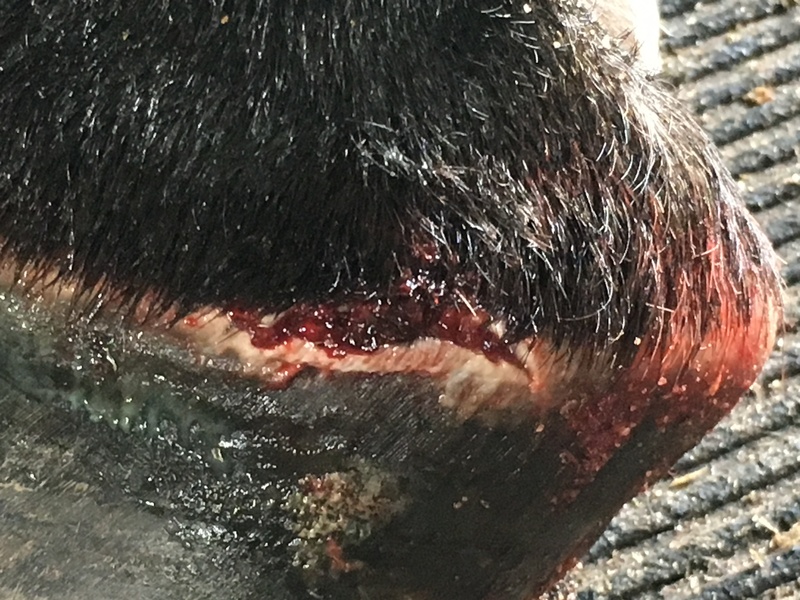 It was Thursday night at 7pm (my farrier is awesome) before my farrier could make it out, but he worked hard on that left front, cutting away a ‘cushion zone’ where the abscess was growing out from the coronary band and likely pinching him (and what we strongly suspected was still causing him some discomfort). Friday afternoon, I was a nervous wreck waiting for the radiograph to pop up on the screen. And when it did, I could hardly believe what I was seeing. For a second, I thought I was looking at the rads from the previous horse. The joint was impossibly clean! The osselets were below the joint, and most likely (per the vet) due to external trauma (repeatedly kicking under a stall door, for example). On cloud nine, I giddily asked Lara if I could put Chip in a modified Training level division for the schooling trials that Sunday (yeah, less than 36 hours away). She said she’d put him in Training-Novice (Training level dressage & stadium, novice XC). So, I packed up, left Chip at Full Gallop for the night, and headed home. Half coffin looked awfully ‘scary’ to me, but Chip never even glanced at the ditch. Instills fear into the heart of every rider. This novice rolltop was nearly prelim height with that brush. No problem for Chip. Saturday morning after feeding, I loaded up my students and their horses, and we hit the road for Aiken. Again. (I wish I could get frequent ‘flier’ miles.) The girls had a fabulous XC school, and I got a very insightful dressage lesson from my old dressage trainer who just happened to be in Aiken at the same time. Sunday morning, Chip and I entered the ring to ride our Training B test for the first time ever. We’d literally not ever even put two of the moves together. And, we came away with a 37.7–a very steady and relaxed test with some canter lengthening, no trot lengthening, but a fairly accurate and obedient test. I was incredibly proud of him. And, then he put in a double clear stadium round that caused 9 dropped rails for 10 riders in the regular training division, putting us in an imaginary 4th after stadium (if you compare scores…not that I do). And he did it with ease. I withdrew him before XC, knowing he could run the novice XC with his eyes closed. He went home a champion in my eyes (and, if you compare scores, not that I do, we might’ve placed 1st if he’d run the training level XC double clear…). I must insert a truly proud moment here and share that my two students both won their divisions as well. Kristin completed her first BN, and Ally ran her second Tadpole on her pony’s first ever horse trial. Chip still has a lot to learn, but he’s exponentially improving with every outing. He pours his heart and soul into everything he does, and I’m so happy to have the opportunity to bring him along. For weeks, even months, now, I’ve been thinking I should resume the blog and chronicle this OTTB retraining journey. But, this morning, I truly felt compelled to share. Back in June, I partnered with Lara Anderson of Full Gallop Farms to take on Chip as a retraining project. When I got Chip, he’d already had some post-track training, but he was missing a lot of basics. But, he had those knees we all want, and he made jumping look effortless. Unfortunately, he’s “not that great a mover,” and he thinks bending is a form of torture. Our dressage scores hover in the mid to upper 30s. What he lacks in flourish, though, he makes up for with try. 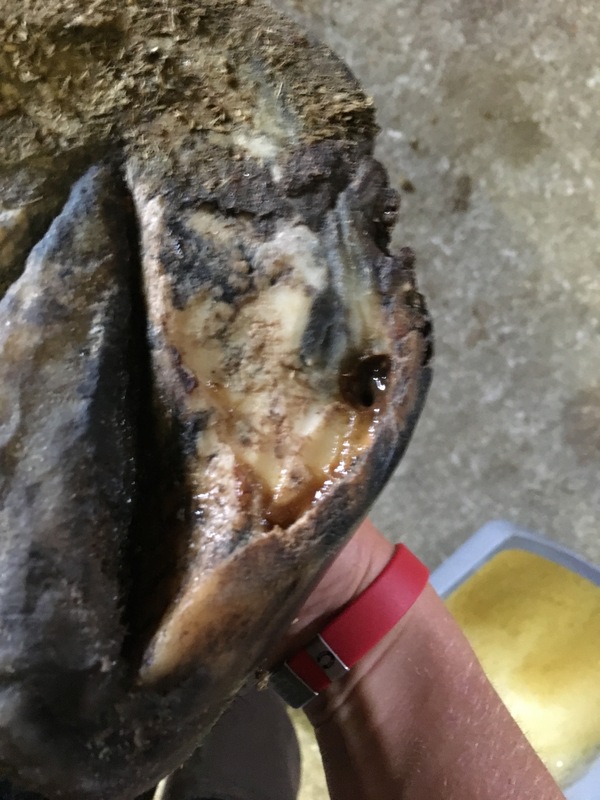 My first thought was abscess, but he’d shown no indication of lameness except being a bit sluggish. We finally decided it was a laceration, so I medicated it and wrapped it. Saturday morning, we rode a dressage test in preparation for the 1 day trial. We actually shaved a couple points off our previous score, so I was fairly happy. Pony was nicely relaxed. But, he just wasn’t himself. Sunday morning, we had a horrible dressage test with a score of 40. He was counterbent on the left lead–looking back, that was a pretty good clue. I toyed with the idea of scratching him. I probably told everyone I saw that I was contemplating scratching him. He wasn’t lame, but he just wasn’t himself. I finally decided that we’d head to stadium warm up, and if he was even slightly hesitant about jumping, I’d scratch. Not only was he bold in warmup, he probably gave me one of my most flawless trips around a stadium course ever. And, 10 minutes later, he flew around cross-country like a seasoned veteran. We came away with 5th place, finishing on our dressage score. The next day, since the vet was going to be out anyway, I had him examine Chip’s ‘laceration.’ It didn’t take long for the vet to decide it warranted a closer look before we made a diagnosis. Radiographs revealed a tract from sole all the way up to the coronary band, so Dr. Myran pulled his shoe and cut away enough sole to offer a way out for the infection. A prescription for soaking, poulticing, and antibiotics, and that was that. An abscess. Not only an abscess, but a mother of an abscess. Big and bad enough that it blew out the bottom overnight. Yesterday, I got my daily Tack of the Day email with a listing for Noble Outfitter tops. I LOVE Noble Outfitter, so I headed to TOTD to check out the goods. Sure enough, they had the 1/4 mock turtleneck show tops as well as the long sleeve mock necks, so I clicked the link. To my surprise, the short-sleeved tops were listed at $6.99!! I, and one of my boarders, instantly snatched at that deal before they ran out of inventory. I am so sorry, but the order that you placed for the Noble Outfitters short sleeved ¼ zip jersey has been cancelled, and your credit card has been refunded. Sadly, our software had a glitch and the site allowed you to purchase the shirt for $6.99, although the advertised price was $16.99. This was an error that we have corrected; the shirt is now back up on the site to be purchased at the correct price of $16.99. If you would like to purchase the short sleeved jersey shirt at the $16.99 price you will have to place a new order. Once again, I apologize for our technical problem. Now. I can fully see where a mistake has been made, but it was NOT a technical glitch. Someone wrongly input the price, and a $10 price difference is just too big a factor in their bottom line. However, and this is what gets me, instead of failing to acknowledge a mistake, Ms. Angelique attempted to dismiss it as a computer glitch. And THIS is something we all have to stand up against. One of the biggest problems in our society, IMHO, is failing to accept consequences of our actions. And I’ll leave it at that. I am disappointed in Tack of the Day…but what do you think? Am I wrong for thinking a company should acknowledge their mistakes and fess up? In my barn, we hang stall chains on the stall fronts for blankets instead of using blanket bars. Blanket bars stick out in the aisleway waiting to catch horse’s hips (or your elbows) as they walk by. Plus, they’re expensive when you start talking quantities. 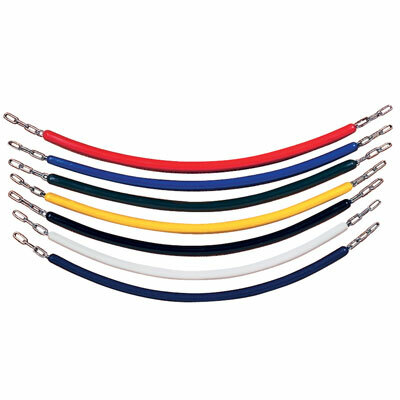 Then again, the stall chains aren’t so cheap, either at an average price of $15.95 each. On the plus side, they come in colors! So, when I needed a handful of blanket hangers, I decided to try something different. At Lowe’s, they sell vinyl-coated weldless steel cable by the foot at $0.36/foot (local prices may vary, obviously). I purchased three 42″ sections of cable, plus a set of ferrules (check the sizes!) for each one, and two double-ended snaps for each set. I think my total cost was somewhere around $17 for everything. Then, use a hammer to smash the ferrule so that it clamps onto the cable (this is an important step). They make a tool for this, but they’re expensive, and a hammer works just as well. Attach both ends to the stall front, and voila! 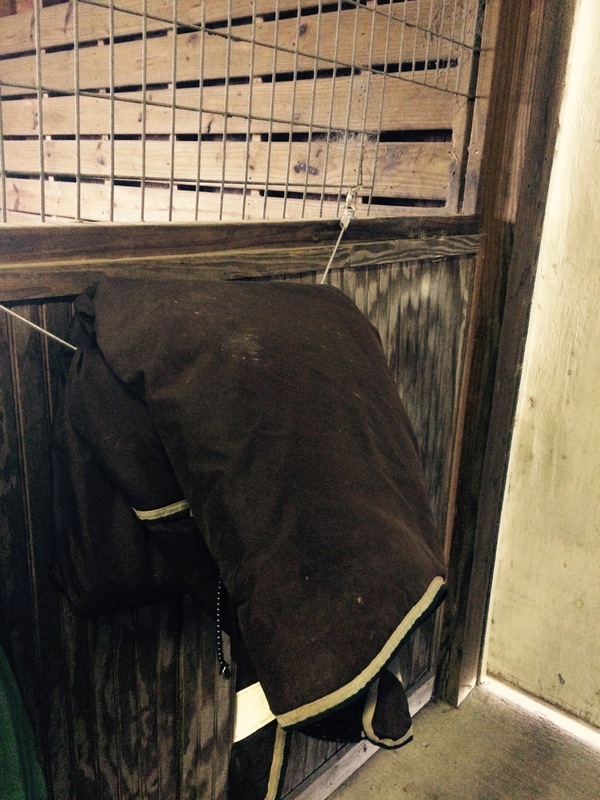 A blanket holder that holds blankets close to the stall–they won’t catch a breeze and come loose, and if you fold them neatly, they give a nice, presentable appearance to the barn. I wouldn’t suggest using these as stall chains, but I imagine you could use these for a lot of other things you might use stall chains for. What other uses do you have for stall chains? Show season has arrived here in the winter Eventing capital of the world. 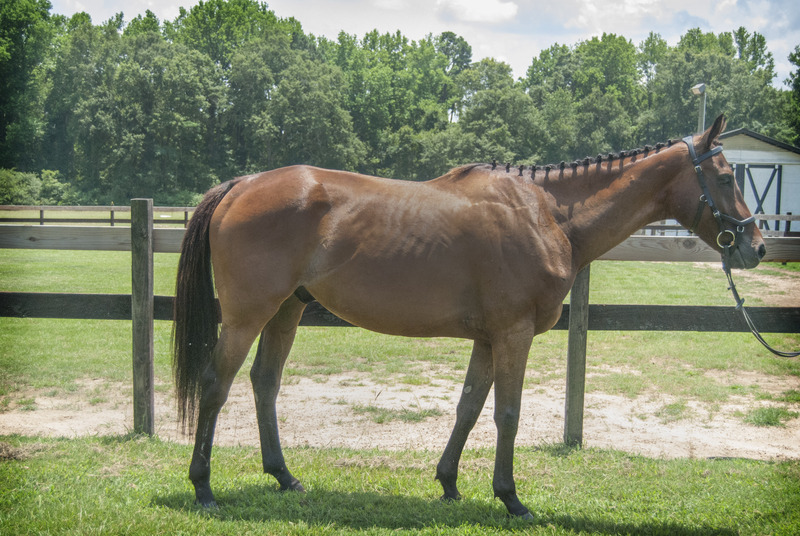 Aiken is hustling and bustling, and now that I’ve got a few horses to prepare for the season, it’s gymnastics season, full-on, here at High Heart! For yesterday’s lesson, we began with a simple walk-trot warm-up just to get the blood flowing. To help establish bend and rhythm, I had Allison trot through a series of poles set on a bend. The curved line of poles were set for a working trot through the middle. Spiraling in or out would result in a shortened or lengthened trot. From there, we moved to a small gymnastic to get him picking up his feet and rocking onto his haunches. 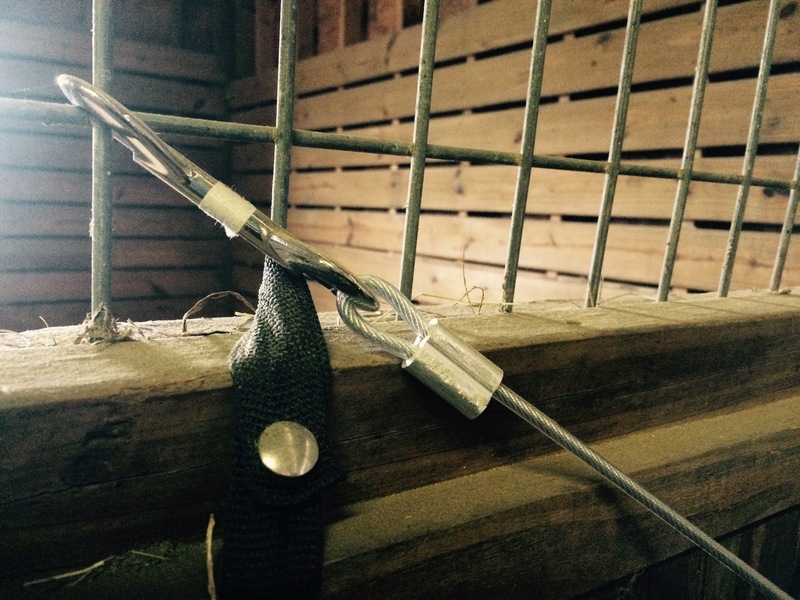 A simple ground pole set 4.5 feet from a cross-rail with a ground pole on the other side set roughly the same distance (adjust per your horse’s stride) meant that Owin had to trot in over the pole, jump, land, and trot out over the pole–a good one for horses who tend to be a bit careless with their feet. This was all still part of the warm-up. Owin made good work of the exercise by simply trotting over the cross-rail. I wasn’t even mad…it was impressive he could pick up all 4 legs that high! So, we bumped it up to a small vertical and got the challenge we were looking for. Note: keep the trot slow and quiet. Don’t let the horse use momentum to get through the exercise, or you’ll defeat the point. Then, we moved back up to the curved line, where I’d set a vertical off the end of the poles about 18′ away. Now I asked Allison to trot Owin through the curved line before straightening and trotting to the vertical. Easy enough, but then I asked her to reverse it. She trotted to the small vertical, landed, then asked Owin to establish a rhythmic trot and bend through the poles. If your horse has a tendency to rush after landing, this one will prove fairly difficult. Keep the vertical low enough that the horse can stay balanced, but high enough to challenge him and make him rock back onto his haunches. It’s booty boot camp for horses!! For the third exercise, I had her trot over that same vertical, but at an angle so that she had a straight 3 strides to a second vertical, then one stride to a wide, ramped oxer. 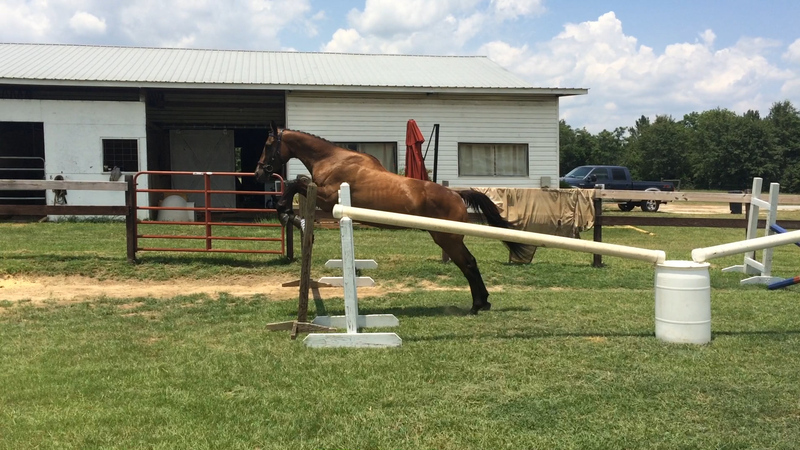 For horses who tend to hang a knee, jumping verticals at an angle can help remind them to snap up that knee. For the rider, it’s a good way to work on holding your line. The three strides gave you plenty of time to build some momentum, but in doing so, you’d jump in too close, miss the 1 stride distance, and have the front rail on the oxer. So, this line has to be ridden fairly accurately. The one stride to the oxer really reminds the horse to sit back and bascule over. The first time through, Owin, a typically flat jumper, rounded his back and caught Allison off-guard. He bumped her out of the tack a bit, reminding her to keep her lower leg secure and not jump ahead. After jumping that line a couple of times, we returned to our first basic gymnastic and converted it to a low wide oxer with a bounce out over a vertical. By trotting in, you force the horse to really push from his haunches up and over the oxer, then do the same for the bounce out. Using momentum makes this exercise easy, but a slower trot in will really make that booty burn! Finally, we put everything together, starting with the angled vertical combination. I had Allison enter from the right hand side with instructions to land either on the left lead or to make a simple change before turning left and heading to the wide oxer bounce. From there, she was to land, return to trot, turn right and trot through the bending poles before popping out over the vertical. We capped off the lesson with trot and canter sets around the ring. For the canter sets, I had her push Owin to a hand gallop up the slight elevation, then half-halt and rebalance for the ‘downhill’ grade. Two trot sets–one in each direction–at 2 minutes each, with 2 minute walk intervals between (we focused on walk-halt transitions during our intervals), then 2 minute canter sets in each direction with another 2 minute walk interval between them (walk-halt-reinback this time). Watch the videos of the wide oxer bounce and then the 3 of them together to see how it all rides.